Stars packs fourteen stories into a slim book; they are spare in description and action, but draw their world clearly. The overarching theme is of rescue from isolation, as each character begins his or her journey alone, mulls over the lost past, dodges threats in the present, and ultimately makes contact with another survivor. Four of the stories that fall in this vein, ‘Nora,’ ‘The Rescue,’ ‘Lost Bonds,’ and ‘A Sailor Girl Goes Ashore’ were previously published, and these introduce four of Helgadóttir’s protagonists: Nora, a woman who sails the open sea while avoiding pirates; Simak, a soldier charged with locating survivors and supplies; Bjørg, a young woman with protectors in the form of genetically-engineered polar bears, called isbos; and Aida, a formerly wealthy and protected teenage girl who becomes a refugee twice-over, first through immigration to the North and then through surviving a deadly plague. Zaki, Aida’s older brother, appears in other chapters detailing his adventures. Some stories are so brief that they lack the build-up necessary for a truly satisfying conclusion. For instance, ‘The Women’s Island’ finds Nora and Aida travelling to an island where they never leave the shoreline as they are greeted by its three inhabitants, an old woman and her two “daughters.” Nora internally marvels that the girls appear to be well-fed and round-cheeked, but she quickly understands that these three are predators not unlike the pirates she eludes, for the true source of both the dried meat offered and the jewelry is human. Nora and Aida quickly retreat and continue their travels. A story that offers such mythic and genre possibilities and is so easily solved almost isn’t a story so much as an anecdote. ‘The End of the World’ suffers from the opposite problem, in that there is so much contained that the story can’t end satisfactorily. Simak and his team are investigating a sighting of a human bonfire when they find a pair of boys who lead them to the remains of what may be an abandoned church of some sort. The walls are decorated with images of animals—which are all but unrecognizable to Simak at first—and people, and there are numerous papers that appear to be a mixture of history and prophecies. The date “2049” is on several of these papers, but it’s unclear what relevance this date has for the characters. The story concludes with the promise that the place will be researched by scientists, and that one of the boys will go back to civilization with Simak. And—there are no further revelations about what these prophecies may indicate, the mystery of the bonfire is dropped, and neither of the boys reappear in the narrative. 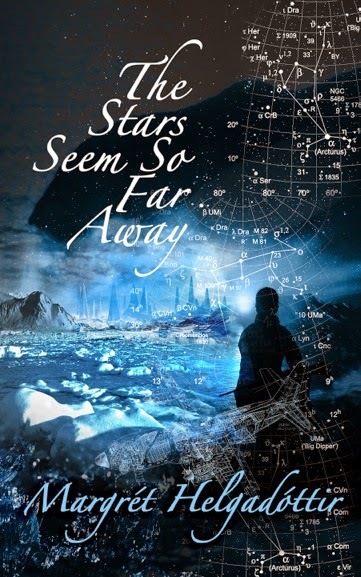 The titular story, ‘The Stars Seem So Far Away,’ features Zaki meeting Roar Haugen, an aged former astronaut, who tells of his adventures in space and how the program fell apart due to lack of funding and mounting expenses. Meeting Zaki compels Roar to finally pick up and move away from the crashed airplane that has been his home for years, and they travel together to find a settlement with the last of the space explorers. In the meantime, Zaki contemplates redemption for abandoning his little sister, and they come across other survivors, both benign and not. The concluding stories chart an abrupt shift from a focus on survival: the main characters become part of a space program to travel to human settlements on other worlds and find new opportunities there. Nora and Bjørg are conflicted about leaving behind the familiarities of home, while Simik, Aida, and Zaki are eager to go forth. This plot seems more hazily sketched in than the others—it’s unclear how the space program functions or what country or settlement runs it, or how, given the scarcity of supplies, it has enough fuel and food. In the final story, ‘Farewell,’ Zoar and the newly introduced Doctor Hege listen as Zaki reports over the radio the shuttle launch and achievement of orbit. Zoar declares that he’s done with adventures even as Hege thinks to herself that she’s not. And so the ending is really just the beginning. The Stars Seem So Far Away is at times an awkward, freshman effort, but well worth reading, for what it lacks in polished prose it makes up for in vivid imagery. Despite the grimness of the world, it is by no means a dystopia; indeed, considering the wariness each character displays for strangers, the vast majority of people introduced are genuinely good people, and it is underlined over and over again that cooperation and collaboration are the way to survive. The few “bad” characters largely remain undeveloped ciphers, which is, I think, a weakness, but a minor one. I wish the book had been twice its length, the better to explore this world and its people, but in its brevity it manages to become something like a fable for the future, promising rewards for good deeds.